It’s a bit silly that I avidly study “styled” displays of decorative items, because I have three boys who consider it their role to re-style any arrangement I make. Nonetheless, I keep my eye out for great objects and projects to bring beauty into our home. And for now, these are all placed well above the reach of little hands. Some staples of a beautifully accessorized room are framed art, vases, books, trays, and boxes… I love the look of a stack of beautiful boxes! I was pondering how to make a set of boxes when inspiration came from the most unexpected source! Remember those three little boys I was talking about? At the start of summer, I ordered three pairs of sandals for them. 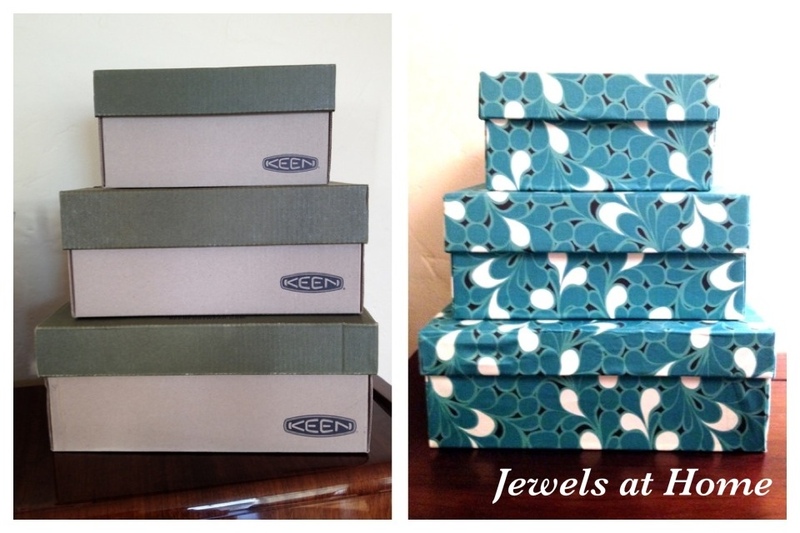 After they arrived and were unpacked, I found myself with a set of three perfectly matched boxes in small, medium, and large! 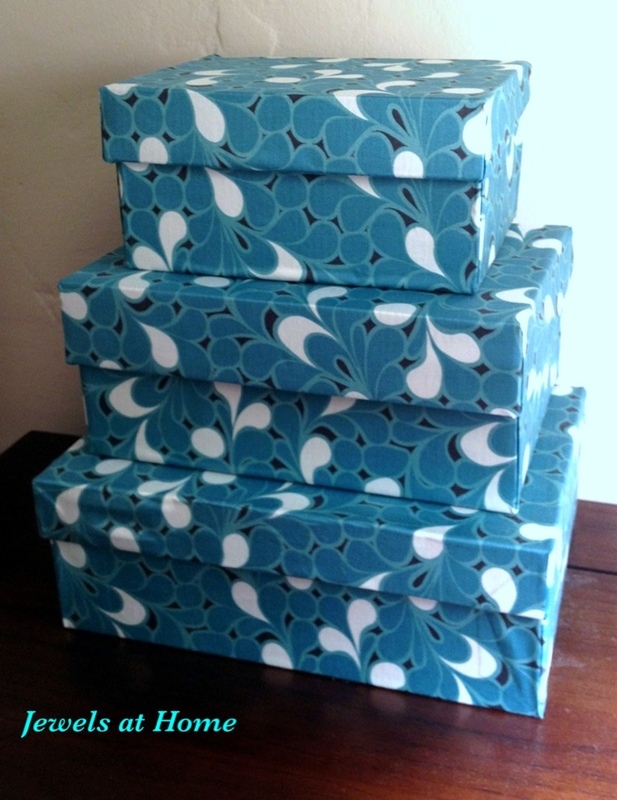 With the addition of some gorgeous fabric I found for just $2.99 a yard, those plain shoe boxes became a beautiful display! 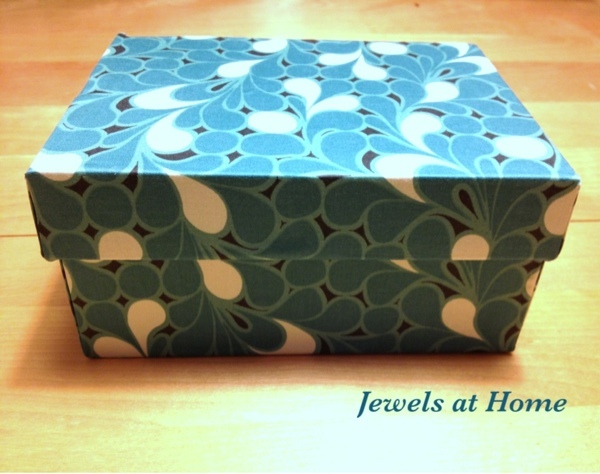 fabric – I used only 2/3 yard for all three boxes. That’s a $2 project! Above left: Fill in any holes in the box design with scrap cardboard. 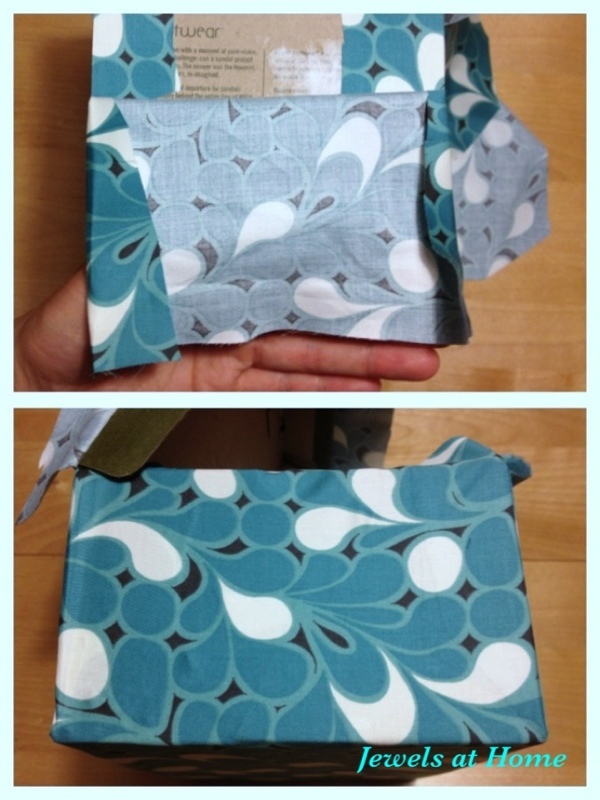 Above right: Cut out fabric to fit wrap around box, including the sides and allowing about an inch extra to wrap to the inside. 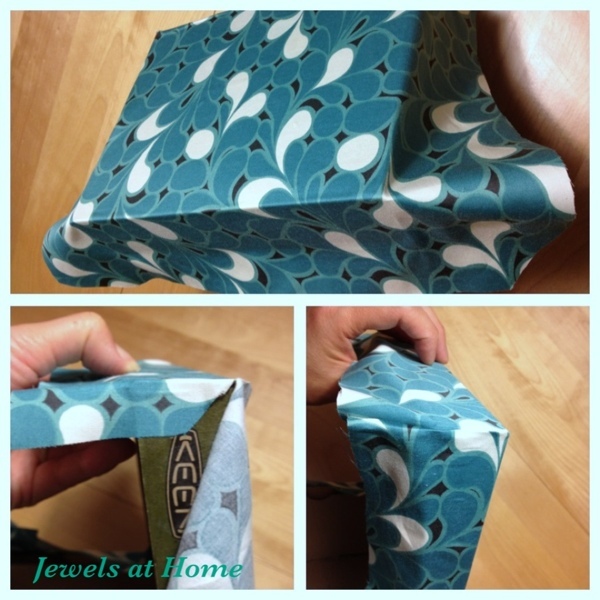 Above top: Use the glue stick to lightly attach the bottom of the box to the fabric. At each front corner, cut diagonally to the bottom corner and trim, as shown. 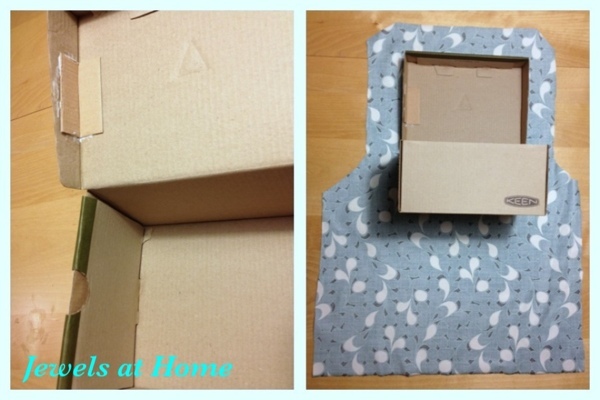 Apply glue stick lightly and fold up the fabric onto the front of the box. Fold flaps from the front towards the side of the box and glue them down securely with the glue stick. 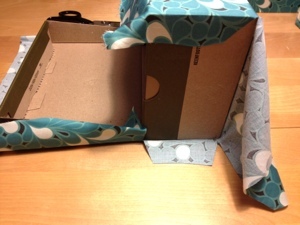 When cutting the flaps at the back of the box, make sure to leave some fabric to wrap the edge of the lid. 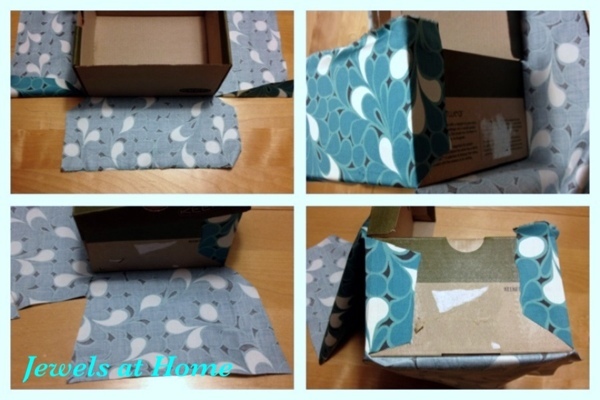 Above bottom: Apply glue stick lightly and fold fabric over the back of the box. At each back corner, cut diagonally to the bottom corner and trim, as shown. Again, fold a flap towards the side of the box and glue it down securely with the glue stick. Above top: For the side flaps, fold in the excess, so that a finished edge lines up with the edge of the box. Above bottom: Apply glue stick liberally, and fold up the side flaps. Above top: Apply glue stick lightly and attach fabric to top of box. Above bottom: At the top corners of the lid, cut the fabric diagonally to the corners and trim. Left: Apply glue lightly to the front of the lid and then glue a flap securely towards each side. Right: fold the side flaps, so a finished edge lines up with the edge of the lid. Glue securely with glue stick. Above left: Trim excess fabric. 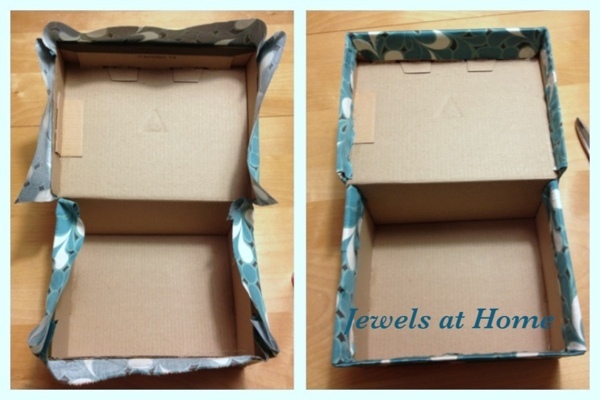 Above right: Use tacky glue to secure the loose fabric to the inside of the box and lid. I’m so happy that these boxes are going to add a wonderful touch of color and style to our living room. So, while my newly-crafted accessories have to stay high out of reach for a few more years, I’m tickled to know that those rambunctious boys who usually mow down all my decorating projects can be credited with inspiring this one! What ordinary objects will you turn into the extraordinary? Thanks, Michelle! I’m always trying new projects that make good use of old items and still look great!